The strong mid-latitude cyclone that was in Wyoming yesterday is now situation in southeastern Saskatchewan and will continue to lift to the northeast. 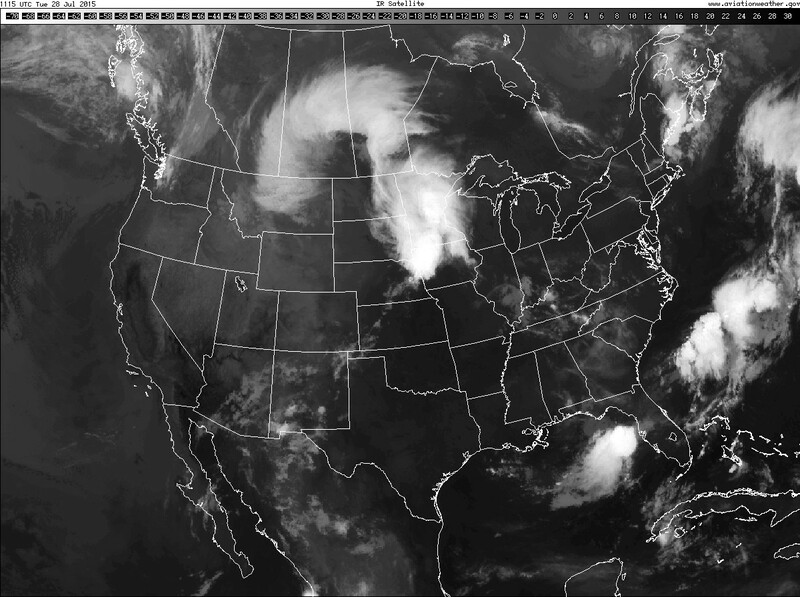 It it clearly shown on satellite imagery as a classic “coma” shaped cloud mass. Under the ‘head’ of the comma will be a persistent light rain through northern Montana that will also likely impact northwestern North Dakota. Temperatures in that region may stay in the upper 50s for much of the day, but also bring much needed rain for those locations. Central and eastern North Dakota and northwestern Minnesota will see a sunny sky or at least a mix of sun and clouds sky develop behind the thunderstorms that are still in the area this morning. 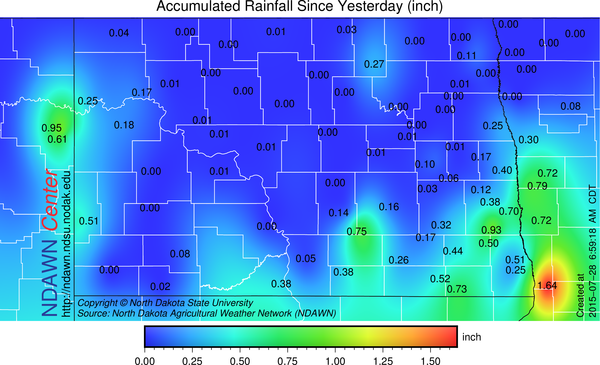 The thunderstorms as usual dropped widely varying rain totals with the Campbell Minnesota station recording the most with 1.64 inches. The rest of the week for the most part looks dry. There will be some activity perhaps Thursday and may be into the weekend, but those events looks fairly spotty at the moment, meaning overall, a high percentage of the region looks to be recording little if any precipitation for the next 7 days. Sensible weather, besides being dry, there will be a strong wind today and still a “healthy” breeze on Wednesday. The strong low that will move to our north will not only create a strong pressure gradient, but also allow for mid-level wind from near 5000 feet to descend to the ground behind the low. The combination will mean wind gust to near 50 mph in the higher terrain in western North Dakota and gust into the 40s at times in eastern North Dakota. Quite strong for this time of year. The wind will remain strong through evening, diminish somewhat overnight, but even on Wednesday the wind will be in the 15-30 mph range from the west/northwest. That would make for three windy days in a row, with the worst easily being today. Temperature wise, the usual fluctuations and today will be quite chilly in western North Dakota with maximums only in the 60s (closer to 80 in the east), but otherwise, temperatures appear to be close to seasonal averages through early next week.